ww2dbaseAbout 4,000 kilometers southwest of the Hawaii Islands, the Marshall Islands represented part of the perimeter of the Japanese Pacific empire. The former German colony was given to Japan after the closure of WW1, and had since been an important part of both offensive and defensive plans of the Japanese Navy. By the end of 1943, Admiral Mineichi Koga of the Japanese Combined Fleet knew the Americans were eyeing the islands, but he could not figure out where they would strike. His difficulties were further complicated by the lack of carrier aircraft, as they were taken away from him in an attempt to reinforce land-based squadrons. With his hands tied, all Koga could do was to send his submarines out as forward observers and order the regional commander in Truk Admiral Masashi Kobayashi to reinforce the island garrisons that were most exposed to American attacks. Kobayashi shifted men to the outer islands of Jaluit, Mili, Wotje, and Maloelap. In total, Kobayashi had 28,000 troops available to him in the Marshall Islands. For a garrison that size ground fortifications were sub-par, but that was rather by design at this stage of the war, for that Tokyo had since decided that the Marshall Islands were to serve only as a part of a delay action campaign. The new defensive perimeter was to be established much closer to the home islands. ww2dbaseAmerican intelligence decoded Japanese messages and detected movements for the outer islands, and decided to change the invasion plans. Unbeknownst to the Japanese, the Americans were now bypassing the reinforced outer islands; they were now directly attacking Kwajalein and Eniwetok. ww2dbaseRear Admiral J. H. Hoover's land-based B-24 Liberator bombers and other attack aircraft of the 7th Air Force from Ellice and Gilbert Islands attacked Mille and Maloelap as early as Nov 1943. ON 3 Dec, Rear Admiral Charles Pownall's Task Force 50 launched a carrier strike against Kwajalein with planes from four fleet carriers and two light carriers. 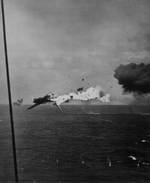 The strike destroyed four transports and fifty Japanese aircraft, though the damage achieved little strategic importance. 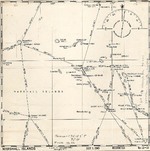 Upon recovery of the planes, Pownall cancelled a planned second strike against the Wotje Atoll in fear of a Japanese counterattack. The counterattack came in the form of night bombing attacks, which the Americans had no means of defense from the air since the American pilots had no night flight training. Lexington took a torpedo hit in one of the night strikes, but the entire task force would eventually return to Pearl Harbor. ww2dbaseMajuro atoll was named to be a forward base in preparation of the invasion. Rear Admiral Harry Hill landed the Reconnaissance Company of the V Amphibious Corps of the United States Marine Corps and the 2nd Battalion of the 106th Infantry of the US Army's 7th Infantry Division, taking the lightly defended atoll on 31 Jan without any casualties. ww2dbaseLogistical problems caused the invasion plans against the Marshall Islands to become delayed for one month, but as soon as Chester Nimitz could gather all the troop transports he needed, he launched Operation Flintlock against the Kwajalein atoll in the south. Rear Admiral Richmond Turner commanded the forces against Kwajalein Island, with Major General Charles Corlett's 7th Infantry Division of the US Army on board. Rear Admiral Richard Connolly, with Major General Harry Schmidt's 4th Marine Division, sailed the Roi-Namur Islands in the north. Rear Admiral Harry Hill's task force was designated the reserve force ready to assist any of the two invasion forces after securing Majuro. The entire operation was covered in the sky by Vice Admiral Marc Mitscher's planes from six fleet carriers and six light carriers, which was escorted by eight battleships and a full compliment of cruisers and destroyers. ww2dbaseOverall The Japanese garrison at the Kwajalein atoll consisted of 8,000 men, but only half of them were combat capable. The other half consisted of conscripts, laborers (many of whom were Koreans), and the Navy's aircraft support personnel. Rear Admiral Monzo Akiyama, located on Kwajalein Island, knew he lacked strong fortifications but his capability to coordinate a damaging aerial counterattack potentially could make up for his shortfalls. ww2dbaseThe opening chapter of the invasion destroyed On 29 Jan 1944, American carrier aircraft attacked Roi-Namur, destroying 92 of the 110 Japanese aircraft that survived the pre-invasion strikes over the previous two months. Akiyama had just lost his ability to mount an effective aerial counterstrike. ww2dbaseThe Roi-Namur invasion started smoothly on 31 Jan on five nearby small islands, but weather and inexperience in amphibious operations caused major confusion and delays during the actual landing on Roi-Namur on the next day. Nevertheless, luck stood with the Americans as Japanese resistance was much lighter than expected after the successful pre-invasion aerial and naval bombardment. The landers only faced a garrison of 300 Japanese. Roi-Namur was secured with only 51 Japanese survived out of the garrison of 3,000 men. "Nothing could have lived through that sea and air bombardment. [The bombardment] was the most damaging thing I have ever seen. [Ashore] I have never seen such a shambled in my life. As you got ashore the beach was a mass of highly colored fish that had been thrown up there by nearby explosions." ww2dbaseHe commented that the bombardment was "the most brilliant success" he ever witnessed. ww2dbaseAkiyama countered the Americans with a series of fierce infantry charges backed by strong bunkers and pillboxes when the Americans advanced. By the start of 2 Feb, only 1,500 out of the original 5,000 garrison were still alive. Much like Roi-Namur, by the time the island was secured, only 265 men survived as captured prisoners; all the rest perished. The Americans lost one for every 100 killed. ww2dbaseEniwetok was an atoll with a series of small islands and islets offering little more than two square miles of land, but the location was strategic, for that they could provide airfields for the subsequent invasion of the Marianas. Major General Yoshimi Nishida bolstered the defenses of the main island some time before Jan 1944, but the small size of the island meant that defense in depth was nearly impossible. Any American attempt to invade the island must be stopped at the beaches, otherwise the main island of Eniwetok would be lost. The main island was guarded by 4,000 men, of which about half were of the Japanese Army and the other half various naval personnel. ww2dbaseThe invasion, Operation Catchpole, began with a naval bombardment on 17 Feb, while 8,000 Marines and 2,000 Army infantry waited aboard transports. On the same day, the 22nd Marine Regiment commanded by Colonel John Walker on Engebi Island in the northern side of the atoll. The Engebi landing was a logistical nightmare that embarrassed Marine Corps Brigadier General Watson who oversaw the operation, though he made up his initial mistakes by securing the island at a casualty count of only 85. On 19 Feb, the 106th Infantry Regiment landed on the main island of Eniwetok after only a brief bombardment. The brief bombardment proved to be ineffective. With automatic fire cris-crossing the landing beaches, American men and equipment soon formed a congested mess, repeating the same logistical nightmare that haunted the invaders. Nevertheless, the island was secured by 21 Feb at the loss of 37 Americans; similarly, nearly the entire 800-strong Japanese garrison died. Next, Watson led his Marines (leaving the Army to occupy Eniwetok Island) to Parry Island. The landers faced similar defenses on Parry, but the logistical problems were averted by a thorough naval bombardment led by battleships Tennessee and Pennsylvania, delivering over 900 tons of explosives on the Japanese defenses before the 22nd Marine Regiment made their landing. Parry Island was secured the next day. ww2dbaseWith the Marshall Islands under American control ten weeks ahead of schedule, Allied engineers started to construct the islands as forward bases for the next phase of the island hopping campaign toward the Japanese home islands. 20 Aug 1943 Admiral Chester Nimitz submitted a general plan for the invasion of the Marshall Islands. 31 Jan 1944 Americans landed on Kwajalein and Majuro atolls in the Marshall Islands. 31 Jan 1944 USS Portland bombarded Djarrit Island, Majuro Atoll, Marshall Islands for 30 minutes before receiving word that there were no Japanese on the island. 7 Feb 1944 American troops completed the conquest of Kwajalein and Majuro Atolls in the Marshall Islands. 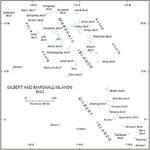 17 Feb 1944 US Marines landed on Eniwetok Atoll in the Marshall Islands. 20 Feb 1944 American troops captured Eniwetok in the Marshall Islands. 22 Feb 1944 Japanese aircraft attacked US Naval Task Force 58 approaching the Mariana Islands but suffered heavy losses. Meanwhile, another Allied forces operating around Rabaul and Kavieng encountered no Japanese aircraft, hinting that Japanese resources were now becoming scarce. my father in law fought in this battle, as well as others in this campaign. we have photos of the aftermath. My dad fought in this battle...he was in the 4th Marine div. he left the US and sailed directly to the island...This was the first for him and seven more invasions follow...And they cry because they have to extend thier tour in Iraq???? My dad, Sam Petkovich, fought in this invasion and was wounded. He was taken to Pearl Harbor to recover. Dad passed away just three years (2004) but I have photos and a certificate Domain of Neptunus Rex ( a pirate document of sorts) that the marines signed giving the name of the ship and the date, January 25th, 1944. My father, P. Mims Rogers, was a Major with the 7th Infantry and fought in this battle under General Corlett, and I have a picture of them together. I would love any information about this battle. My father told me he fought in Marshell Island in 1944?, he recieved the bronze star what I dont know. I have a picture of him and a buddy in their MP unifrom taken in South Pacific. He was in Army infantry, thats all I know would love to know more. His name Roy Patton. My dad Tommy Oran Wheeless was in the army 1939-45. he passed in 1994. he recieved 3 purple hearts, i believe he fought on the marshall islands. My grandfather by the name, Terruo Tsuwano, if i'm correct, was captured by the american after the world war 2 on Aerok, Ailinglaplap, Marshall Islands, and haven't been heard from sinced. I am hoping to find information about on him, and hopefully to reconnect with any relatives, if any. Please feel free to contact me at the e-mail above, if any info on this man. He left a son behind my grandmother passed away 4 years ago. My father who was in the toke the troops onshore in the Marshal Islands. The only thing he told me about the invasion that after the invasion was over him and one other person was in charge of burring the bodies of the Japanese. He brought back with him a bayonet,rifle, and some Japanese money. He also said while on the island Japanese aircraft flew over but had no bombs. I had a Uncle who serviced in the 4th Marine Division He died on Feb. 2 1944 in the first invasion in the Marshall Islands. I have so many family members who were kill on world warII on,kwajelin, Marshall Islands. My mom was 2 years that time. I am a Marshallese and I am Very Proud of The U.S Army and soilder who were die for My country ." I joseph,boas ,promoise to do my best,to do my duty to God and my Country and to obey the people from United state of America." My grandfather served in the Marshall islands as a Sgt. in the Army Air Corps. we have photos of him with a PFC. Charles Lubic. if anybody knew about the units that were stationed there, or airbases plz contact me via email. MY FATHER, PFC FRANK H. ERNST FOUGHT IN THE MARSHALL ISLANDS DURING WWII! THANKS DAD FOR YOUR EFFORTS. IT WILL NEVER BE FORGOTTEN. my father leland skinner was in the marshall islands where he got shot in june 1944.He was in camp Roberts California in march25 - june 23,1943.I have alot of pictures of him & his buddies there would like to share with anyone who father has been there too.He also was in 7 infantry division in Okinawa, Ryukyu Islands. iso info on Douglas Ralph Byers who served in Australia and New Gineau in WWII. there is family leave in Ailinglaplap half japanese half marshallese Tsuwano. My uncle was on Kwajalein with the Army Air Corps, right after the battle. Does anyone know the Air Corps unit numbers at that time? I would be so proud if U.S military could remember the Marshallese men and also list their names who served as scout for the U.S military during the WW2 in the Marshall Islands and send their names to RMI government. To Charles Aucoin. Your uncle Charles Lada is memorialized on a plaque on Roi-Namur Island that was put in place in February of this year in commemoration of the 70th Anniversary of the battle of Roi-Namur. To Anonymous Lucky Lady. there are currently several efforts underway to memorialize the efforts of the Marshallese Scouts during World War II. I believe these effects include one by the U.S. Army and one on behalf of the U.S. Ambassador to the Marshall Islands. My uncle, whom I was named after, was killed on Roi Island on February 12 1944 during the battle of Kwajalein. He was a Leutenant jg in the USNR. The Japanese bombed an amunition dump which resulted in a huge explosion and inferno. If anyone has any information about this incident or about my uncle please contact my. Thinking of my father, in the 7th infantry in the battle of Kwajalein on this Memorial Day 2015. He received a bronze star for his leadership. Was later a Captain. My father Dell Goss,served with 7th infantry, 184th California division company M. He received bronze star with oak leaf clusters along with purple harts. I still have some of his leggings and other "souvenirs"
My uncle, who I never met, was killed in the battle of Kwajeline. I was born in 1945. I believe he was a sniper. I was looking for a list of casualties, but have never found one. Nobody left in the family has much information. His name was Charles Swan. My Dad fought on the Marshall Islands in 1944 with the 7th Cav, and was awarded the purple heart . my mother has waited for 5 years since his death to get his heart and never did and I am his son and feel I deserve his Purple Heart . My Dad was Richard D. Ettinger 7th Cav . I was based on Kwajalein from 1945 to '46. I wrote a book, "Spam Cans, Rice Balls and Pearls" which has considerable information about Kwaj as I knew it at that time. I knew some of the natives and often wondered how many casualties they suffered during our invasion. My father, John J. O'CONNELL , served with the 100th Seabee battalion in the Marshal Islands. He went ashore with a Marine Division on Roi. Don't know much more as dad wouldn't talk about it. Was also on Majuro. Was a hard hat diver. Any more info to fill in the blanks? My Dad (Burt Norris Groves) served on the USS Pennsylvania, he was a gunners mate 3 class. He died when I was young, it was not untale about 10 years ago that I looked up his ship. I was amazed at what I found out, I knew very little about what the Pennsylvania was about, or just what took place. Please send me all you can about Mr Groves and the mighty JSS Pennsylvania. First, I want to thank the providers of this web page for making it possible for me to be able to contribute my experiences in the battle (invasion) of Kwajalein , Jan. 31-Feb3rd 1944. Yes, I was there, this is a first hand actual account of the invasion through the eyes of an 18 year old kid from Oklahoma. I was, at that time , a very excited young man , about to make his first run to the beach as the coxswain of a Higgins Landing Craft loaded with troops . I had watched the terrific high altitude bombing of the island, then the battle ship shelling , and finally the dive bombers . And once the air power bombings & ships' cannons had pulverized the island, the actual invasion began . Our boats, loaded with troops , swarmed in the lagoon waters . A GREY HAZE HUNG OVER THE ISLAND. Sounds of small caliper weapons and occasional explosive could be heard as we neared our respective landing targets. Boats faltered, for a moment . An unexpected traffic jam of landing craft had temporarily blocked the passage of our boats to the beach , but out of no where jumps this older guy , he's standing on a coral rock, he's waving his hands, yelling at us, and pointing the way to go! He yelled at us, "go this way..." and with a traffic cops' signals he direct us to a safe passage way. I drop my ramp, the troops wade ashore , I go back to the ship , load up again , again and again . keeping this up until we are all finished bringing in what's needed . From out of no where I'm selected/ordered to stay ashore on the atoll . I am to live in a pub tent, eat with the Army. My assignment , was to provide the Army via my boat , transportation of all their needs, supplies and etc. from the cargo ships in the lagoon/harbor. That I did, but I also was conscripted to help bury the bodies of the Japanese Imperial Marines. Which I did ! And in that capacity I witnessed first hand the ugliness of war. While my Unit 34 shipmates went back on board their ship, I stayed on Kwajalein . This sounds morbid, but it was a beautiful sight to have witnessed the U S A's military might . Does the Marshall W Lyons in this record match the person in your tree? Did anyone know Stanley Lukowski? He was in the 106th Infantry Regiment, 27th Infantry Division and died on February 20, 1944. He was my great uncle. Thank you! My Father-In-Law (a Marine) lost his life in the Marshall Island waters during WWII. His body was never identified. What steps will we need to take to investigate if his remains were ever found? Visit the “Defense POW/MIA Accounting Agency” website at http://www.dpaa.mil/. They have a list of still missing men from World War II separated by state (place of enlistment, probably). Your question speaks to exactly what this agency does all the time. My dad was in the navy. And in the raid Roi,Kwajalien Atoll, by the Japanese. February 1944. In his belongs I found dogtags which I assume were a friend of his. Name is Robert Wallace Rush T .12-42 USN B. I do not know how to find to who his family members might be. My dad died after the war in 1963. So I could never ask him , I was 13. And didn't know of the dog tags. Would like to return them, but don't know who or how. if any one knows? you can contact me.